On February 18th, one of Toronto's most notable and established restaurants, NOTA BENE, relaunched with a new look, menu and concept. After seven years in the Queen West neighbourhood, Executive Chef and Owner, David Lee, decided it was the right time to "evolve and update the restaurant from top to bottom". Still located on 180 Queen St. W., one of the main focal points at the new NOTA BENE is the art piece, shown below. Treated with "Shou Sugi Ban", an ancient Japanese process of preserving wood by charring it with fire, the salvaged iron wood tree trunk is showcased at the front of the restaurant with a canopy represented by a 3-D printed installation. The bar has been extended to accommodate more guests. We started with a few cocktails and snacks in the lounge. 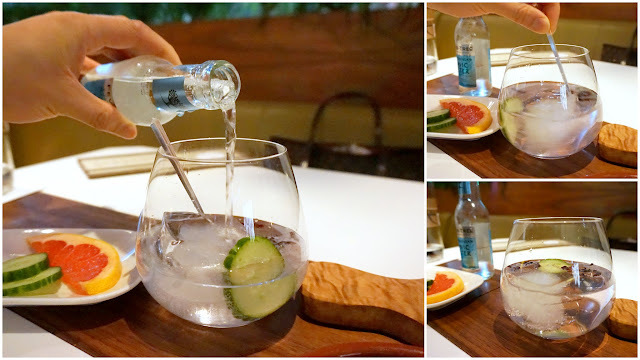 NOTA BENE (Twitter: @NotaBeneToronto, Facebook: Nota Bene Restaurant) has a special Gin & Tonic menu where guests can choose from 15 different gins, 3 varieties of Fever Tree tonic water, and three types of ice: crushed, cubed or large. For this particular tonic water, the colour changes into a very subtle purple after a bit of stirring. Super neat and tasty. This is most certainly the best G&T I've had in awhile. The snacks menu, which is offered for $4 from 4-7pm and $7 from 7pm to close, has changed quite a bit since my last visit at NOTA BENE; the only snacks I recognized were the salt cod fritters and the Cumbrae Farms beef sliders. The restaurant's "4-7" menu has also been extended to include a selection of $12 small plates from 4pm - close. It's hard for me to pass on ceviche, and it's equally hard for me to pass on hamachi. The hamachi ceviche and the snacks were stellar, with my favourites being the salt cod fritters and the crisp pork cheek. After we finished our cocktails and snacks, we headed to the dining room for dinner. The new space was designed by +tongtong, an award-winning design firm based in Toronto. Notice the installation of tumble weeds on the ceiling. The entire back wall of the restaurant is screened by this beautiful luminescent mural. Developed in collaboration with Chef Lee's long-standing kitchen team, led by Chef de Cuisine Geoff O’Connor, NOTA BENE’s food is inspired by the Chef's extensive travel and love of cooking in season. Using local ingredients - such as beef, pork and lamb from Cumbrae Farms, wild and foraged items from Marc's Mushrooms, and heirloom vegetables from Vicki's Veggies and Cookstown Greens - help inspire Chef Lee's creative process. Below is a tasting of some of the dishes from NOTA BENE's new menu. We left it up to Chef Lee (@chef_davidlee) to decide what to serve us. Sake pairings for our sashimi plate. NOTA BENE’s new menu focuses on using local and seasonal ingredients with clean and simple flavours. Every dish I had that evening had some, if not all, of those elements. A glance at NOTA BENE's menu and you'll also notice a clear emphasis on seafood, such as their Hamachi, Big Eye Tuna, Tunisian Octopus, and the Japanese Sashimi Plate appetizers. Worth noting is that the sashimi plate uses fish sourced directly from Japan's Tsukiji Fish Market, and it is offered from Thursday to Saturday nights only. 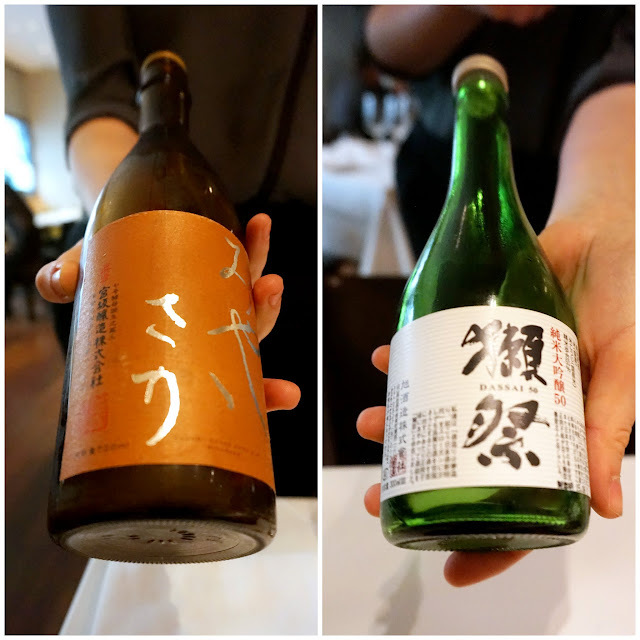 A tip for you: if you're getting the sashimi plate make sure you get the sake pairing because both our sakes were fantastic with the sashimi! I must say I'm very happy to see sake making an appearance a non-Japanese restaurant! Anyway, besides appetizers, Chef Lee's mains also feature sustainable seafood options like B.C. Halibut Cheeks and Fraser River Sturgeon. The highlights for me at NOTA BENE were the Heirloom Cookstown Carrots, Tunisian Octopus, and the St. Canut Farms Suckling Pig. Sourced from Cookstown Greens, the carrots were phenomenal with the creamy and thick "sunflower" sour cream, and the Malaysian curry oil and kale really helped cut some of that richness. It was a very delightful and balanced dish. Just as impressive was the tender Tunisian Octopus; with only a dash of olive oil and minimal ingredients, the octopus was allowed to really shine on its own. The incredibly crispy skin on the suckling pig won me over, and the pork itself was very juicy and moist. I actually really enjoyed the Crisp Duck Salad too, since the duck reminded me of Peking Duck! The Haldimand County Lamb Shoulder was good and I remember appreciating the Indian and Mediterranean components of the dish, but somewhat similar to the St. Canut Farm Suckling Pig, I found the tasting portion of the mains a bit too small, especially because my friend and I shared everything. Having a bite each, at most two, wasn't enough for me to tell why I enjoyed the lamb shoulder (the suckling pig was easier because I could tell after one bite that the skin was crispy and the meat was juicy). I hope you guys understand that I'm not being greedy; sometimes it's just hard to tell whether I like a dish or not, or why I like it or not like it, from just one bite. Moving on to desserts, my choice out of the three would be the Sticky Date Pudding, an updated version of the ever-popular sticky toffee pudding. The rum raisins and the brown butter ice cream elevated the dessert and brought everything together nicely.The "pudding" itself was also moist and very decadent. The rhubarb compote was too sour for me but my friend liked it, however, we both thought the granola was a bit too hard and crunchy. I thought the chocolate ganache "fleur de sel" was good, but not great. I enjoyed the chocolate ganache and the ice cream, but wasn't too crazy about the other components in the dessert.